Social media’s interactive qualities allow for meaningful exchanges between potential leads and businesses. Yet there is always the possibility of negative interactions: a post discounting a product, a negative review, or a comment blaming a company for a problem. How can you respond to these negative comments in a productive, respectful way? This post will walk you through some helpful tips for successfully responding to difficult social media posts. This seems counter-intuitive, but we are only as strong as our strongest critics. Although negative social media exposure may negatively impact your company in the short run, critical comments reveal issues that you may not have been aware of and allow you to correct your actions for better customer experiences in the future. As you can see in the example, the response leads with this element. 2. Respectfully disagree, and back up your position with solid logic. It's important to remember that every customer is entitled to his or her own opinion. If you know that the negative comment is incorrect, respect the customer's opinion by disagreeing in a courteous way. Then, support your view in a logical, even-tempered manner. Cite examples to provide extra credentials to your argument and make sure each point transitions naturally to the next. If the unsatisfied customer refers to a negative experience with your company, take action to amelierate the situation. Remember: your main goal should always be to provide a solution for the author’s problem or complaint. 3. End your response on a light-hearted note. No one wants to listen to a Debbie Downer. 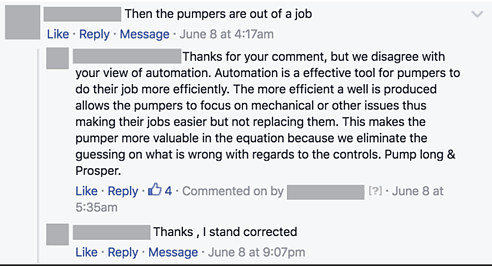 Just as your response should start by thanking the author of the original post, your rebuttal should end with an up-lifting or light-hearted comment. Think of this as two bookends of cordiality: the first warms your audience up to your opinion, and the second reminds them that your intentions are to help them. Ending on a light-hearted note prevents the post from coming off as arrogant and reduces any animosity felt by the author of the negative comment. Although many social media platforms have a character limit to begin with, make sure you are not responding with a novel. Cover the essentials but keep the response concise. 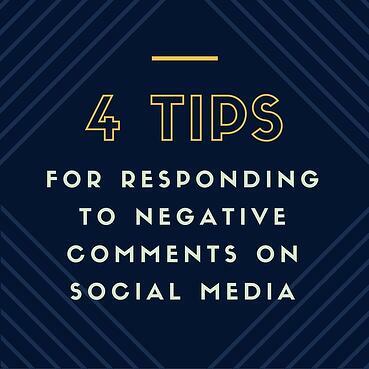 Successfully responding to negative social media posts shows that your company listens to their customers and cares about providing solutions. It’s a chance to evaluate feedback and possibly convert a disgruntled customer into a loyal client. Takeaway: If you do get negative feedback it's OK — you can turn it into a positive. Engage in the "conflict" in a constructive way and show that you're genuine. Your business will reflect integrity and passion! Win!